They’re not from Manchester and they’re not quite an orchestra but they did release one of the biggest indie rock albums of the year with their third studio album Simple Math which debuted at number twenty-one on the Billboard 200 and sold 18,000 units in its opening week. UTG had the opportunity to speak with bassist Jonathan Corley about the success of Simple Math, some experiences on the road, and what keeps the band going after seven years of hard work. 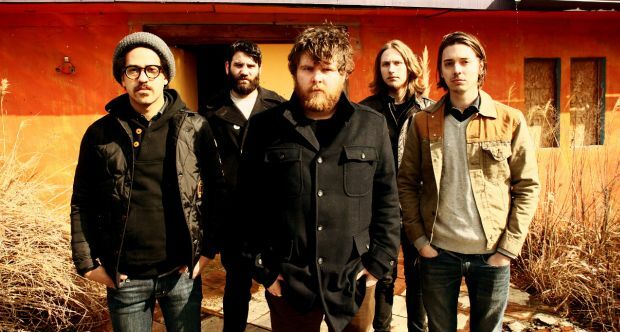 Please read on and get the scoop on Manchester Orchestra. How did Manchester Orchestra come to be? The band has been around for about seven years now. While it started briefly as Andy’s acoustic project, each of us played in different bands together throughout high school and Manchester Orchestra soon became a project that we focused on. When the lineup solidified, we started touring in support of our first EP and never really looked back. Simple Math was one of the biggest indie rock releases of the year. How have you been enjoying the success of the album? We have done a few tours supporting the record. I’ve been really shocked by the positive feedback from fans. It’s been interesting to watch the way people react to songs live after spending a few months processing the album. What was the inspiration behind the title and theme of the album? The song ‘Simple Math’ was one of the most seamless during the writing process. We immediately realized that it would be a song that has a large impact, and pretty soon began to focus on the concept and applying it toward the entire album. How would you say Simple Math differs from your previous releases? Lyrically, it is far more introspective, or at least specific about personal situations. This record was the first time that we have incorporated a string arrangement into certain songs. Again we’ve moved toward exaggerating both the quiet, intimate parts and loud abrasive sections of our sound. Do side projects ever interfere with the writing and recording process for the band? Side projects are an important creative outlet for members of the band. I don’t think that they interfere with MO at all. If anything, it keeps creative juices flowing and allows for the exploration of completely different ground sonically. How different is the experience of playing on television shows such as The Late Show with David Letterman compared to playing a regular concert? I’ve always enjoyed the Late Show performances, though they can be a bit nerve-wracking. While playing a show, we generally have nearly two hours to appeal to listeners in a variety of different ways. On shows like Letterman, you have one take of a single song’s performance. The last time we played ‘Virgin’ on Letterman without even rehearsing with the kids choir, or horn section leading up to that day. It was a pretty incredible thing to watch everything come together so well. How does it feel to have so many artists that want to remix and sample your music in their works? Whenever another artist samples our work it’s absolutely a compliment. Sampling and collaboration is easier than ever, and certainly and exciting direction that music is shifting toward. How was your recent tour with The Dear Hunter? Those guys are a pleasure to tour with. We had the opportunity to work with Casey and Nick on their Color EP Project (collaborating on the RED EP months before the tour). I saw them play a show with our labelmates O’Brother last year in Brooklyn and was immediately impressed. This recent tour was more than fun, and it’s great to be able to watch bands like The Dear Hunter and White Denim play every night. Any upcoming tours in the works? We have some dates coming up in Australia in a few months. During 2011, we were pretty consistently on the road in support of Simple Math, and we’re taking a couple of months at home to focus on the studio. Whenever we have time off the road, the band inevitably returns to the studio to begin working on new material. What’s your most memorable moment from being on the road? After a fantastic tour through the UK and Germany, we sold out a show in London the night before going home. We were staying at this hotel right across from Hyde Park, and sat down for breakfast in the hotel lobby. While eating, a middle-aged man walked into the hotel and stole our drummer’s backpack. He walked out with a Laptop, hard drive, iPod, Camera, and other personal belongings. We later watched the entire incident on the hotel’s security camera. Jeremiah’s Passport was also inside his stolen backpack, which meant that he couldn’t fly back home the next day. After an amazing London show, we drove to the airport without Jeremiah the next morning. I approached the ticketing desk, to check in and receive my boarding pass and when I opened up my Passport was shocked that I was holding Jeremiah’s. The two must have been accidentally switched at Customs while returning from Germany. I realized that my Passport was actually inside of the stolen backpack. I left the airport for the US Embassy, and missed my flight home. Making the best of the situation, I spent some time with a friend in Oxford before flying home. What keeps Manchester Orchestra in motion? We are all huge fans of music. I’m always fascinated by the way an album can impact people in entirely different ways. This band has taken me places that I never dreamed of visiting and allowed me to build incredibly meaningful relationships with people that I wouldn’t have come across otherwise.